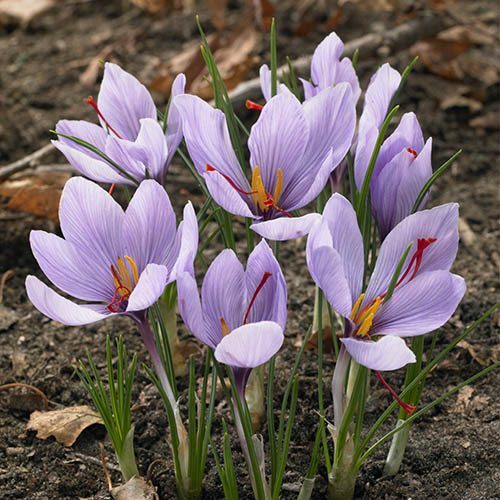 'Saffron Crocus' produces large, veined purple flowers, each with fiery orange-red stigmas. From this amazing little plant comes the highly treasured spice, Saffron! Saffron is the most expensive spice in the world, and comes from the dried stigmas of the flowers. Plant your bulbs in drifts and they'll reward you year after year with a lovely show of flowers. The beautiful 'Saffron Crocus' produces large, veined purple flowers, each with fiery orange-red stigmas that provide a lovely contrast with the delicate petals of its blooms. From this amazing little plant comes the highly treasured spice, Saffron! Saffron is the most expensive spice in the world, and comes from the dried stigmas of the flowers - now you can grow your very own to add sumptuous flavour to mashed potatoes, paella and fish pie! Plant your bulbs in drifts in well drained soil (large pots are ideal) and they'll reward you year after year in late summer and early autumn with a lovely show of flowers. Then don't forget to hand pick your own saffron spice to dry and store for use throughout the year - a little goes a long way! Supplied as a pack of 12 bulbs, ready for planting. Size 7+.